Luxurious long soft needles are the trademark of the slash pine tree, a hardy native conifer and wonderful wildlife protector. The shade these trees provide is more open than a dense, broad canopied tree like a live oak, so nearby plants can get enough light yet with a bit of protection, too. 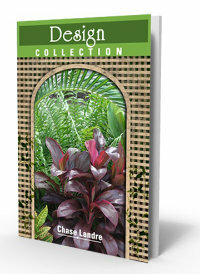 This setting is ideal for many shrubs and groundcovers. Slash pines create a natural bird sanctuary...they provide shelter to birds from predators, attract the pileated woodpecker (the big "Woody Woodpecker"), and are home to owls. Even eagles and egrets will make their nests in the treetops of a large pine. Pine seeds are a great food source for squirrels and other animals. Some people love pines. Others think they're the messiest trees ever. Yes, there are pine cones...and pine needles fall to blanket the ground beneath. However, the dried needles - known as "pine straw" - can be used as a free, natural mulch for other garden areas. Pines don't necessarily "go" with every landscape. A young tree like the one pictured above will eventually tower over most things around it. These trees have a woodsy look to them, especially when planted in groups. There's safety in numbers, as well - lightning strikes are less likely to happen to tall trees planted in groups rather than an isolated single specimen. This tree does well in any area of Florida and other southeastern states. 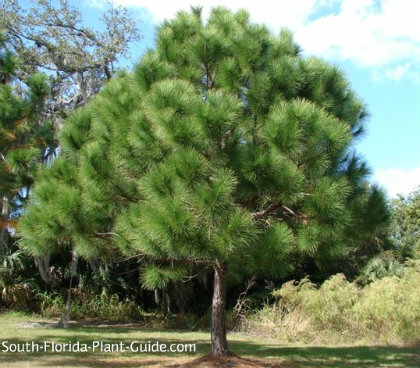 There are many types of pine trees in Florida, but the slash pine is the most common one sold for home landscapes. Densa pine (pinus elliottii var. 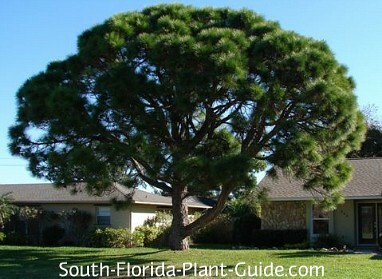 densa) - also known as South Florida slash pine - is a smaller, pretty pine sometimes available from plant nurseries. Slash pine trees are moderate to fast growers that can reach 60 to 80 feet tall. They need full sun and well-drained soil. This tree is cold hardy and does well anywhere in Florida. No soil amendments are necessary when planting a slash pine tree. No trimming is needed either. Water, however, is very important to this tree. It needs a location that's well-drained but requires a regular watering. 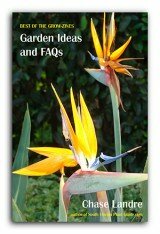 Fertilize three times a year - in spring, summer and autumn - with a quality granular fertilizer. Avoid planting grass beneath a pine. The fallen needles will cover it up anyway, and lawn equipment can cause damage to roots and trunks. Instead leave the area open so that the pine straw forms a natural base around it, or underplant with green or silver saw palmetto for an "old Florida" look. Pines don't like having their root systems disturbed...such as being run over by lawn mowers or having shrubs added or removed around the trunk. Place this tree 10 to 12 feet or more from the house. Because some surface roots can form as a slash pine tree matures, allow at least 6 feet of space between the tree and drives or walkways. COMPANION PLANT SUGGESTIONS: Under the tree itself, the ideal plant is a saw palmetto, and plan on leaving it there. Nearby plants could include gardenia and azalea, which enjoy a more acidic soil and will contribute to the look of a woodland setting.